RUSH: Cavuto had an interesting point yesterday. CAVUTO: While no one is taxing our bank holdings, thanks to Obamacare, they are going after some of our other assets. Remember that 3.8% Medicare surtax on investment sales larger than a couple hundred grand. Surprised? The next time you try to sell your house, trust me, you’ll be hitting the roof. I want you to think about that. A tax not on your income, earned or unearned, but your assets, what you have, what you own, your tangible assets. Homes here, bank account’s there. Is there really a difference? No. RUSH: His point is in Cyprus they made a move — they haven’t pulled it off yet — they made a move to just claim between six and 10% of everybody’s money that’s in the bank. You know how they tried to mollify this yesterday? They tried class envy. They went to the people and said, “Okay, okay, we’ll just take the money of the rich,” and the people of Cyprus said, “Screw you, you’re not taking anybody’s money.” They didn’t fall for it. The middle class and the poor in Cyprus did not say, “Oh, okay, go ahead and take theirs and leave ours alone.” They did not go for that. Anyway, Cavuto’s point is Obama’s already doing it, and you’ll find out when you sell your house or sell anything. And he’s right. There’s a 3.8% Medicare surtax on the sale of any asset over a couple hundred grand, which would include your house. So if you sell your house somewhere down the road, don’t expect the real estate agent to tell you about it at the get-go. A lot of people, lot of low-information people are gonna find out there’s a 3.8% Obamacare tax, federal tax on the transaction, on the sale. So Cavuto’s point, they’ve already done it here. They didn’t go for our bank accounts. They’ve gone for other assets, but private property is private property. RUSH: Tom in Dexter, Michigan. Tom, I’m glad you waited. It’s great to have you on the program, sir. Hi. CALLER: Rush, it’s good to be here, and I couldn’t have asked for a better lead-in than that Hillsdale piece, because what I wanted to talk to you about was Obama’s quantitative easing and the Cypriot bank account seizure. CALLER: This is in context with a book by a publisher that was a new book by a Hillsdale economics prof, a guy by the name of Gary Wolfram. CALLER: Wolfram likens dollars to shares of stock, and when you do something like expanding the money supply, it’s like a private company diluting their stock — which, in the real world, is a form of counterfeiting. It’s illegal. That’s what you had here Cyprus. It may not be subtle, but at least they’re honest about it. They walked into the bank with a gun and said, “Stick ’em up,” if they’re seizing assets. Whereas when we get something like quantitative easing or the expansion of the money supply, it’s a very subtle thing where they just kind of leave the worthless paper out there in the market and it devalues the assets. RUSH: You know, I must tell you something, Tom. You are very shrewd. Quantitative easing, the simple definition is printing money. RUSH: But even more than that, what are they doing with this money they’re printing? They are giving it away. You can call it counterfeiting. I mean, in a sense, it is. CALLER: The net result is the same. RUSH: It’s not money that’s based on anything. It’s just expanding the money supply. But then they’re giving the money to people, a specific group of people to invest in the stock market. It’s being used, essentially, to buy securities. But forget that for a moment. The point is that they’re devaluing the dollar. They are essentially doing a Cypriot move like you say. Instead of walking in the bank with a gun and saying, “Give me your money,” they’re essentially devaluing the dollar, and everybody’s savings are losing a lot of value, probably more than 10% as a result of this. What are we up to, QE3? CALLER: Yeah, and at 14,000 the stock market now is nowhere near 14,000 of four years ago because the money’s different. CALLER: The 14,000 is different because we’re using a different yardstick now. CALLER: The Wolfram book is an economics book. It’s A Capitalist Manifesto, and it’s brilliant. But it gets into a lot of this, and I just found this analogy on the quantitative easing fascinating. RUSH: Are you the author? CALLER: I am not the author. 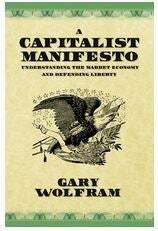 Gary Wolfram is the author. RUSH: You’re not Gary Wolfram? CALLER: I’m just a writer. RUSH: Well, it’s obviously moved you. RUSH: Is it easily understood by laypeople? CALLER: It has issues and I thought you’d like this one about the money supply. It fits with Cyprus and what they’re doing. RUSH: Right. Well, I’ll tell you this. When you tell people, “printing money” to them, “Oh, there’s more money out there! That’s cool, Mabel.” No. It’s devaluing the currency. It’s supply and demand. Look, economic education this country has never been that good, but it is really woefully bad now. So when people talk about quantitative easing or printing more money and you say, “Yeah, well, that’s really devaluing the value of your savings,” they don’t have any idea why. They don’t get the connection. When Elizabeth Warren asked, “Why isn’t the minimum wage 22 bucks?” I guarantee you, most every low-information person is gonna say, “Yeah! Why isn’t it 22?” You try to explain it to ’em, and you lose ’em, but I’m gonna try. I’m still gonna try. How many times have I tried this? I’ll just try it again. They tried the Obama class-envy approach, and the people of Cyprus shot the whole thing down. So this thing has been killed for now. For now. The next time they do it, they won’t tell anybody in advance they’re gonna do it. They’re just gonna do it. They will do this. They’re a government. They’re out of money! They’re broke. They will do this. If I lived there, I would not put my money back in a bank, had I taken it out. I wouldn’t. I’d make ’em come to my house and get it from underneath the bed or wherever I put it.